Liz Davis, Julia Baldouin and Claire Humbert stand among their huge donation to the Stuff-A-Bus effort. The trio's car was packed with several boxes of school supplies. The donation represented the efforts of many members of the SUNY Oswego community including the Campus Center, the Psychology Department, the Division of Graduate Studies and others. Liz Davis, Julia Baldouin and Claire Humbert stand among their huge donation to the Stuff-A-Bus effort. The trio’s car was packed with several boxes of school supplies. The donation represented the efforts of many members of the SUNY Oswego community including the Campus Center, the Psychology Department, the Division of Graduate Studies and others. OSWEGO, NY – Students who need school supplies when they head back to classes next month will find a bus load of donations, thanks to the United Way. 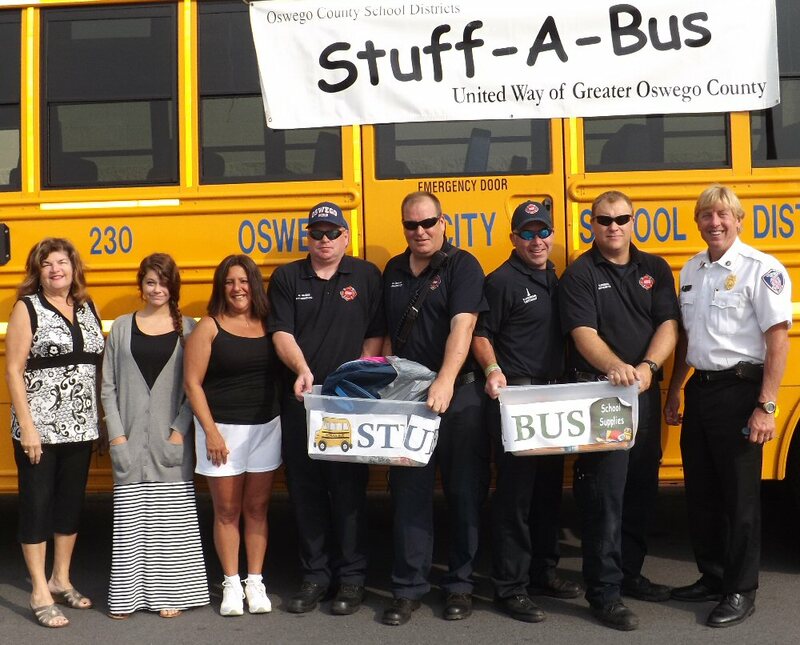 In an effort to ensure every child is prepared for school, the United Way of Greater Oswego County held its annual “Stuff a Bus” campaign on Wednesday at different bus locations around the county. Buses were parked at various locations around the county. Individuals, groups, businesses and organizations stopped by to donate everything from pens and pencils to backpacks and calculators. A representative of ARISE made a donation. Debra Kingsley from 31 Consulting added to the pile. Several Wal-Mart shoppers made it a point to make a few extra purchases to donate on the way out. The same scenes were playing out at the other sites as well. Jackie Wiegand, marketing administrator with Compass Credit Union on George Street in Oswego, presents Roger Sprague with some donations on Wednesday morning at the Oswego Wal-Mart site. 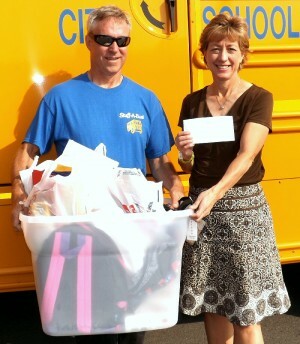 The annual Stuff a Bus Harborfest Breakfast last month also raised money to help the effort. That money was used to buy supplies that were added to the county donations, explained Jo Ann Conzone, administrative assistant to the Oswego school superintendent, and chair of the 2014 campaign. “That bought an awful lot of school supplies,” she said. The buses rolled up to the designated off-loading site shortly after 3 p.m. and volunteers went about the task of sorting and organizing the donations. The seats were jam-packed with large cardboard boxes instead of school children. The boxes, many of the overflowing with supplies, contained everything from pencils and spiral notebooks (tons of spiral notebooks) to thumb drives and calculators. “Everything has worked out very well,” Conzone said. Last year, they were able to help more than 1,200 students and their families. Members of the Oswego Fire Department and some friends pose for a photo after dropping off their large collection of school supplies. School supplies will be available for those who would find it challenging to purchase the supplies that their child need for school. Volunteers will be on hand to assist and guide the children and to make sure that they get the supplies they really need. For more information on the Stuff-A-Bus campaign contact your United Way office at 593-1900. Families are urged to attend the distribution in their school district only. If there are any supplies not distributed on the above dates, they will be made available to teachers to give to students in their classes who are not able to purchase the supplies they need. For more information on the “Stuff-A-Bus” campaign, call 593-1900.